Nevron plastics & metals is a customized job shop, specializing in precision fabrication to customer specifications. With over 40 years of experience, we pride ourselves on providing our customers with quality products, on-time delivery, with a quick turn-around time. 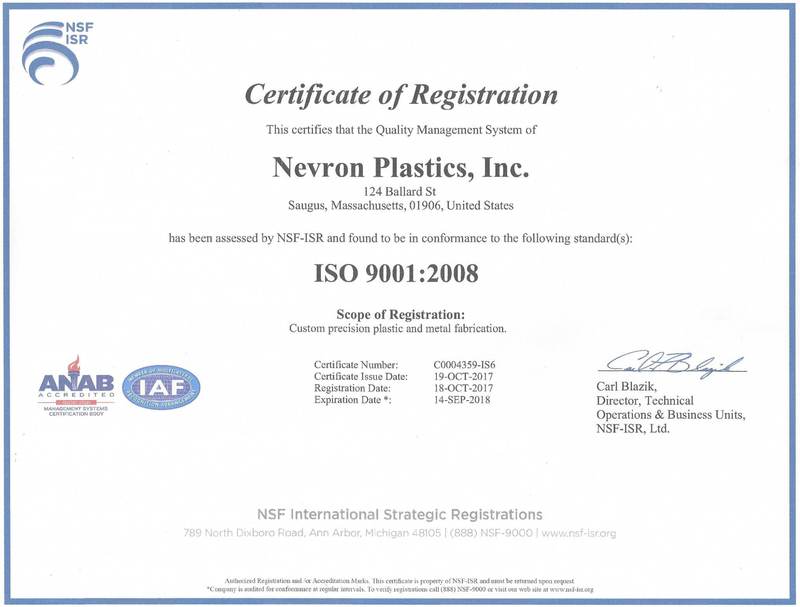 Nevron Plastics & Metals is ISO 9001:2008 certified, and has been awarded Raytheon Company’s 4-star supplier excellence award. I am confident that you will find that choosing Nevron plastics & metals is the right choice for all of your plastics & metals fabrication needs. Contact us today for a quote. Our company has the ability to handle a variety of plastics and metals to accommodate the diverse customer parts we produce. We have recently expanded our stock room to store more raw materials. We also purchase all of our materials directly from the manufacturer, and pass these savings on to our customers. We have the capability to handle all size jobs, from prototypes to full production. Our fully-integrated CAD/CAM and CNC production department allows us to produce parts quickly and efficiently. Coupled with loyal employees, many of whom have been with Nevron Plastics & Metals for 25+ years, Nevron can supply superior products, on-time, and in short time. We have extensive contacts in the hardware industry, and have worked closely with many manufacturers, as well as distributors, in order to provide superior products at the best pricing.